Summary Broadcom-based AC1750 class router with Gigabit Ethernet ports and USB 2.0 & 3.0 storage and printer sharing. Replaces R6300. This product has been retested. See this article for the results. People still buy a lot of AC1750 class routers. Enough, apparently, for NETGEAR to spend the time and money designing a new one. 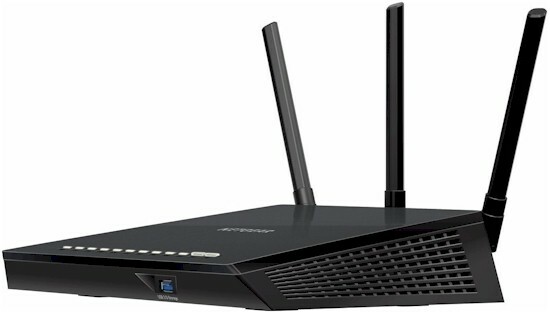 The R6400 AC1750 Smart WiFi Router replaces NETGEAR's R6300, which has been its mainstay AC1750 router. The original R6300 was introduced in 2012, followed by the v2 in 2014. While the R6400 isn't part of the Nighthawk family, its physical design is more akin to the original top-selling AC1900 class R7000 Nighthawk and less-popular AC2350 class R7500 Nighthawk X4. The R6400 has three external dual-band dipole antennas vs. the R6300's six single band internals. But to save cost, the R6400's antennas don't attach via RP-SMA antennas like the Nighthawk's do. The R6400's port complement is the same as the R6300's: USB 2.0; USB 3.0; and Gigabit Ethernet. The front panel has a complete array of wireless and wired LAN link / activity indicators, which can be shut off if desired (power light stays on). Both Wi-Fi on / off and WPS buttons are also conveniently located here. The USB 3.0 port is located just below the lights. The rear holds all the Ethernet connectors, USB 2.0 port and power switch. NETGEAR put the FCC internal photos under short-term wraps, so the review sample was opened for examination after testing was completed. The physical redesign dictated a new board design and NETGEAR did a nice job with it. The new board is clean and tidy, with significant parts reduction, which should help NETGEAR make more money on the R6400 even with its lower $149.99 MSRP. Popping off the RF can top reveals the same Broadcom BCM4331 2.4 GHz and BCM4360 5 GHz radios found in both R6300 models. The bottom of the board is the new home of the Broadcom BCM4708A CPU and RAM and flash. They're here so they can be connected via thermal pads to a heatsink plate that takes up most of the bottom of the case. Photos of it and comparisons of the R6300, R6300v2 and R6400 boards are in the gallery below. The table below summarizes the major components for the three routers. The biggest change between the R6300v2 and R6400 is a different 2.4 GHz transmit power amplifier and the addition of receive Low Noise Amplifiers (LNA) for both bands.